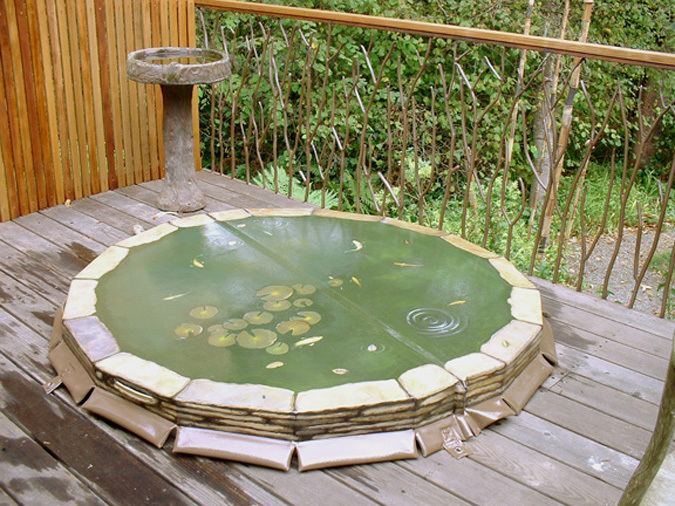 Vinyl hot tub cover painted to resemble a Koi goldfish pond for a private home in northern California. This project required a special primer which bonds with the vinyl as well as the paint, and prevents the chemicals present in the vinyl from “migrating” into the paint. "Plasticizer migration" would prevent the paint from ever drying completely, but this primer, made for the sign-painting industry solves the problem. The paint is acrylic, which remains flexible when dry, and the whole thing is coated with a varnish with UV inhibitors, which also remains flexible when dry. Everyone seems to ask about these details, so I thought I'd include them here.